Having sampled Timothy Taylor Landlord, an English pale ale, in bottle recently it brought back the commanding heights of English brewing. The cask version in England would only be better. The flavour of these beers – meaning old school bitter and pale ale – is often incomparable. While lower amounts of hops are used today vs. the 1800s, the balance and gastronomic quality resulting from using English hop varieties especially for aroma are evident. If you used 1800s levels of hops they would equal a typical modern IPA in intensity and might often be better, beer for beer. This brings to mind the many local attempts, by which I mean, Canadian, Ontarian, American, to make an English beer similar to England’s surviving best old-school beers. I’ve tasted many of them in the last 40 years. I am not talking here about English-inspired beers that use local hops for terroir and practical reasons – this ended by creating the American pale ale/IPA format – but where local brewers try to emulate the English taste. This means in part using English hops brought here, just as European brewers successfully use New World hops to create American-style beers there. Rarely can I recall an English bitter or pale ale being successfully made here. They don’t really come close, in my experience. 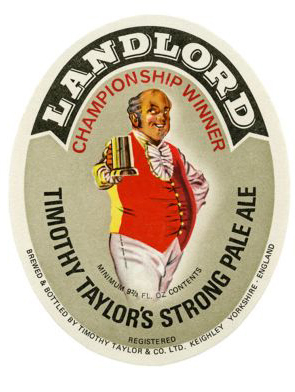 We can get the malts or use similar ones of our own; we can get the hops; we can adjust brewing waters; we can select an English yeast; we can do cask; so why can’t we make a Timothy Taylor Landlord? The English-type beers I’ve tasted rarely have the right malt profile, often I get a kind of mixed or “cracker” grain flavour, as e.g. for Goose Island’s (quite decent) Bitter Half the other day. I wonder if it comes from using too many malts. Where brewers disclose the number you read often of 5, 6 or more malts being used. Is this really necessary? 1800s pale ale used one malt. Modern bitter often combines just pale malt and caramel malt. I’ve had English-style beers with wheat in them – Britain does this too now sometimes – and I cannot see why this grain is necessary. It seems often to thin the beer and leave a faint dryness that doesn’t belong in pale ale. You want – or I want – a clean sweet maltiness, the Maris Otter Pete Brown writes so well of in his new book is ideal but I’ve had many North American beers with great malt qualities. Celebration Ale from Sierra Nevada, for example. Use that malt profile with English hops and you should end up with something Hook Norton, Timothy Taylor, Shepherd Neame, or many other English brewers would be proud of. I’m not complaining, as we have innovated many styles of beer that now form part of the Gambrinal pantheon. But a fine English-style beer should be part of many brewers’ ranges. I did have the odd beer over time that did deliver the true taste. Once, at Russian River in California. Probably the odd one in Ontario or Montreal over the years. But even when the profile is right it’s usually too timid. You can get a small burst of flowery hop that is clearly English but it should dominate the beer, as say it did years ago for John Martin’s Special Pale Ale, brewed at the time if memory serves by Courage in Bristol. Where the taste gets close, in other words, it doesn’t take you all the way – for me, that is, and here we speak of course of our palate, our tastes, but I can’t imagine a true English beer wouldn’t attract followers here. For one thing it’s a market opportunity given the proliferation of IPAs and pale ales with the American stamp. Europe is brewing our styles faithfully; we should be returning the favour, not just for Germany or Belgium – overdone! – but for England’s classic forms of pale ale, bitter, and strong ale. Note re image: the image shown was sourced from Timothy Taylor’s website. All intellectual property therein belongs solely to the lawful owner or authorized user, as applicable. Image is used for educational and historic purposes. All feedback welcomed.